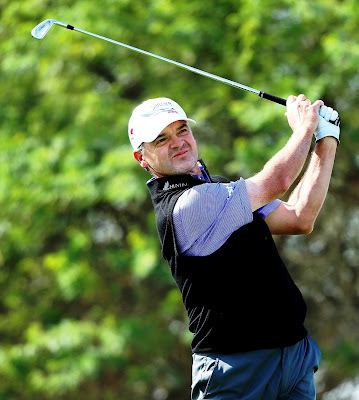 Paul Lawrie continued his Portugal Masters form with a brilliant round of six-under-par 65 at Montrose Links today (WED) to win his first appearance of the season on the North-east Alliance season by five strokes. It was a master class of links golf in a rising wind with birdies at five of the first six holes on his way to an outward 32, marred only by a bogey at the ninth. Lawrie pushed his bag of birdies up to seven with further gains at the 10th and 15th for an inward 33. The field of 99, of whom 20 had No Returns, was the highest of the NE Alliance season - and most of them were astonished with Paul's performances. Lawrie summed up his round: "It was just a solid day. Hit it well from tee to green. Gave myself a lot of chances and putted nicely again. It was good to keep the form going from last week in Portugal. "The Montrose course I thought was in very good condition - as always some tough holes mixed in with some good birdie chances." Joint second on the one-under 70 mark were Royal Aberdeen amateur Nick Macandrew (33-37) and Newmachar tour pro John Duff, finishing in the top two for the fifth time at the seventh fixture of the new season. Duff would have finished much closer to Lawrie but for bogeying the last three holes after birdies at the fifth, sixth, 11th and 15th. Macandrew highlighted his card with an eagle 3 at the sixth and birdies at the second, ninth, 14th and 18th. Paul Lawrie's elder son Craig finished fourth on his own on level par 71. Craig's inward half of 37 included double bogey 6s at the 10th and 17th. 65 P Lawrie (Carnegie) 32-33. 78 P Craig (Kintore) 40-38, R Reid (Tarland) 36-42, C Duffus (Royal Aberdeen) 38-40, P McLean (Paul Lawrie GC) 36-42. 83 D Cassie (Nigg Bay) 41-42, S Christie (Aboyne) 44-39. 94 G Mackie (Caledonian) 48-46. 95 M Smith (Inverurie) 44-51, R Ruddiman (Royal Aberdeen) 46-49. 97 M Rendall (Stonehaven) 46-51, R Brown (Kemnay) 43-54. K Beveridge, J Hamilton, M Brown, S Davidson, D Lawrie, B McPherson, B Nicolson, D Robertson, P Walker, P Cheyne, J Forrest, D Leslie, J Stewart, J Hosie, G Riley, C Gilbert, M Rogers, F Bisset, I Still, R Tulloch. Class 1 - C Cassie (7) 70; B Ritchie (5) bih, P Craig (7) bih, J Borthwick (4) bih, C Duffus (7) 71. Class 2 - M Allan (10) 69; S Christie (12) 71; D Cassie (11) bih, D Lane (10) 72; L Roger (11) 73. LEADING AMATEUR (not on scratch prizelist) - F Milne (Banchory).